USB Doc Martens. Oh yeah. I went to university in the 90s. In my PJs and docs. Yup. My wardrobe had lots of plaid and flannel and several pairs of docs. I loved my docs. I even found this ridiculous pair of white leather 10-hole Docs in Montreal and if my Mom had still been alive and we'd been doing a real wedding (vs. eloping to Jamaica as we did), I would have soooooo bought those to wear on my wedding day. And my Mom would have laughed her a** off. She was good like that. In fact, I loved Docs so much and for so long that my saddest post-pregnancy moment was realizing that my very high arches had collapsed a bit (even after losing all the baby weight) and that only 1 of my 4 pairs of docs still fit me. It was with great sadness that my Docs were all bundled up and shipped to Sally Ann, where I'm sure they became the pride of some angst-ridden teenager who thought my Docs were trendy and kewl and $3. A moment of silence for my Docs. Apparently there is someone out there who gets me, thinks like me, and remembers that people love to buy stuff that reminds them of their youth (back when they were just as geeky and waaaaaaayyyyyy less kewl). And so, I present to you a wonderfully retro (can you say that about the 90s?) 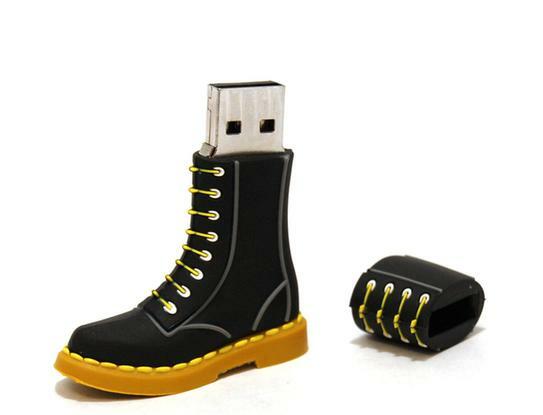 12-hole Doc Martens USB key. Oh yeah. That's what I said. U.S.B. Key. 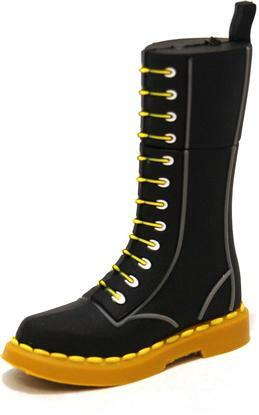 Offered to you by the one and only Doc Martens store. Remember: Keep it at work or your own angst-ridden kids will steal this from you in no time. And no, if you buy one for yourself, it is NOT ok to buy them one too. You really want your kids walking around with the same stuff as you? Seriously, you have an image to uphold.